Not to be confused with World 1-3, Level 1-3, or Stage 1-3. Area 1-3 is the third course of Coaster Hills and the third course overall in Mario vs. Donkey Kong: Mini-Land Mayhem!. It introduces Warp Pipes. The level features two Mini Marios, though not necessarily in the same starting positions. One Mini Mario begins on the lower level near the center, and the other begins on the upper level near a Warp Pipe entrance, with the exit door on the middle level to the right. In order to reach it, the top Mini Mario has to be lured into hitting the left wall on the middle level while the bottom Mini Mario must enter the Warp Pipe. If done correctly, they will be led right to the exit. The M-Token is located at the bottom right of the level. It can be collected simply by having the bottom Mini Mario touch a Red Girder wall on the left, then constructing a Red Girder alcove over the Spike Trap to reach it. 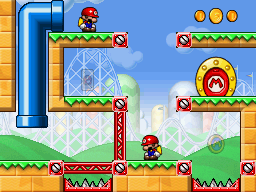 The Mini Mario Card is located on the middle level over to the left. It can be collected by having the top Mini Mario fall into the middle level while it is facing left.